Nigeria Rise Concert is one big post independence show (for previous post of this event, click here) you will dare not to miss. Slated to hold on Sunday, the 9th of October, 2016 at Sheraton Hotels, Abuja. A Project Know Thyself Initiative and in partnership with AGN, DJ's Association, Abuja Comedians Association, Nigeria Police, Bloggers In Abuja and many Media platforms. It has been described to be the mother of all concerts because it will pioneer a way forward with hope for Nigeria. WE Fm's Stanley Bentu. one of the organizers expressed hope in the Nigerian brand and tasked Nigerians to largely come out and be a part of a better future for Nigeria with a commitment to contribute their quota in his speech. 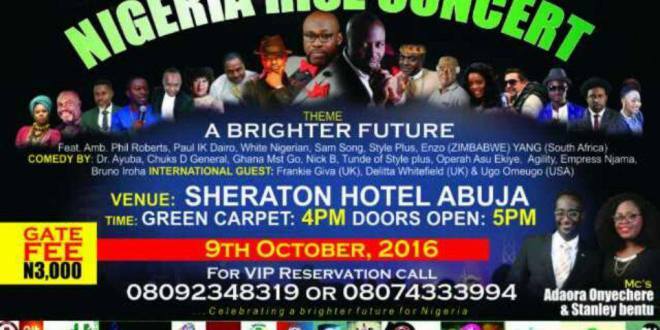 To attend Nigeria Rise Concert, Click HERE to register.